Can Clint Dempsey please move to Liverpool already? Another day, another layer added to the saga of Clint Dempsey’s inevitable exit from Fulham. The latest has the west London club getting its knickers in a twist because Liverpool manager Brendan Rodgers said he would like the 29-year-old Dempsey in Liverpool red. Fulham has made an official complaint to the Premier League over the matter. 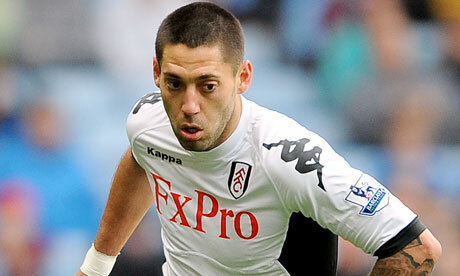 Fulham manager Martin Jol is frustrated because Dempsey clearly wants to leave so he can play on a bigger stage before it is too late. Dempsey reportedly refused to play in Fulham’s opening game last weekend – a 5-0 win against Norwich – and will not play again on Saturday against Manchester United. “His head was turned. That is the problem,” Jol told The Daily Mail. ‘There are always players who want to move, but they keep quiet. This was different. It would have been better if Liverpool followed up with a formal bid, but they didn’t, so until now there is no bid. Continuing to complicate matters is Liverpool’s own inability to move Andy Carroll out of Anfield. Rodgers wants to make a move with Carroll because he knows he needs the money to bring in a new player, but isn’t willing to just give him away – especially to his former club, Newcastle United. Rodgers is right – the team needs strikers – but Carroll just isn’t the answer. He couldn’t even get on the field Thursday in Liverpool’s Europa League game with Hearts of Midlothian, a 1-0 win for Liverpool thanks to an own goal by Hearts’ Andy Webster. If Rodgers doesn’t have enough faith in Caroll to play him against a Scottish Premier League team that is winless this season, then why would he put him on the pitch against the likes of Manchester City, Manchester United or Chelsea? Liverpool can’t afford to just give Carroll away, but keeping him on the team doesn’t really help anyone. The team needs to make some kind of decision and move on. Because while the Premier League season is a marathon, not a sprint, it could get late pretty quickly for Liverpool if they are not careful.